We’d love your help. Let us know what’s wrong with this preview of Christianity by Dennis McCallum. Ideal for new teachers and group studies, this very readable apologetic presents a clear, rational defense for Christianity to those unfamiliar with the Bible. Readers will consider the validity of Christian beliefs, overcome barriers to faith, and be challenged to meet Christ personally. To ask other readers questions about Christianity, please sign up. 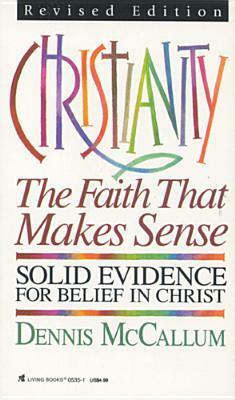 What is Faith Makes Sense? In 1987 I was camping with my family in Wyoming near the Grand Tetons. We began talking to a couple of single guys in the campsite about spiritual matters. They came over later to our campfire, and sat down for a lengthy talk about whether God was real and whether we could know him. When I explained how I had come to faith, and how the Bible was self-validating, they leaned forward with interest. The talk went on for several hours. By the time we went to bed, they were b What is Faith Makes Sense? When I explained how I had come to faith, and how the Bible was self-validating, they leaned forward with interest. The talk went on for several hours. By the time we went to bed, they were both thanking us, and saying they had never heard anything like this before. There was one problem. They were headed toward Alaska. We were headed toward Ohio. I knew I would probably never see these guys again. The next morning, I wanted to leave them with something to read. But nothing I could think of was satisfactory. C. S. Lewis Mere Christianity was way old. I decided that day to write a book that people could give to interested explorers. This would be the thinking person's guide to why we believe the Bible. 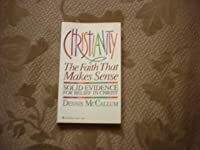 My title was Investigating Christianity, and we sold several thousand copies under this title. Then, Tyndale asked if they could publish it and I signed it with them. It has sold over 120,000 copies (over 20,000 from Xenos Sales). I have received so many emails from people who have told me how they met Christ though this book. That has been the most satisfying part of the project. We routinely give it away here for any visitors to our meetings. Funny story: This kid came to Christ in prison in our area, and when he got out he came to my home church and became a disciple. He told me how he had come to Christ through this book he read called "Faith Makes Sense" in a funny way but I ignored that. We hung out weekly for months until one day he came in and threw the book on the table, crying in astonishment, "That's you!" (The picture on the back is like 20 years old and looks nothing like me). He had never connected the dots, and by then we were good friends. concise. The evidence is there. I also recommend watching Ben Stein's Expelled. Remember Paul reasoned with the jews in their synagogues for 3days straight. He reasoned. He is a reason-given creature. He used his reason and combined it with faith. This book answers some of the toughest questions about Christianity and God. It's great for anyone investigating Christianity or those working with people who are. This book has also been published in Mandarin Chinese! An original, up-to-date way of explaining our status post-Redemption in the eyes of God. Takes the approach of putting forth Biblical prophecy as the defining mark of Christianity's validity. Dennis is Lead pastor of Xenos Fellowship, which is a grassroots house church planting ministry. Since beginning the group as a student Ohio State University, during the Jesus movement, he has remained interested in reproducing church features found in the New Testament. Xenos focuses on Bible exposition at its meetings, and most of Dennis' books focus on Bible teaching.